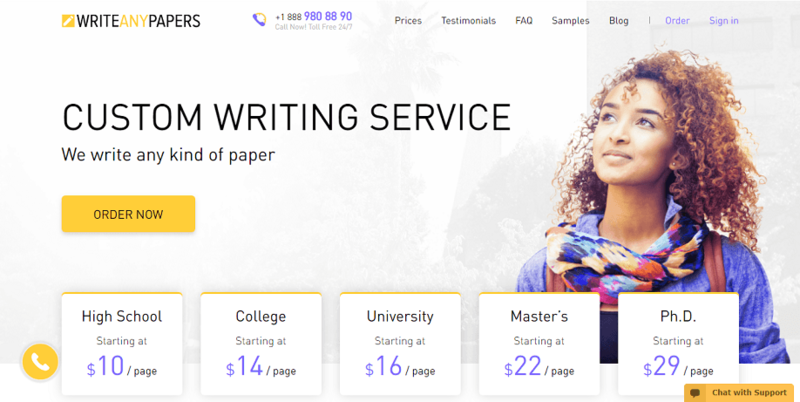 Marketed as a professional custom essay writing service for students, 10Writers initially comes across as a sure-fire way to get your academic assignments completed on your behalf, so you don’t have to worry about doing them yourself while still meeting your deadline and getting the grades you deserve. Today, we’re going to take a detailed look into 10 Writers to see what it’s all about and whether it’s the service that’s going to be right for you. We’re going to take everything into account, so let’s just jump right into it! 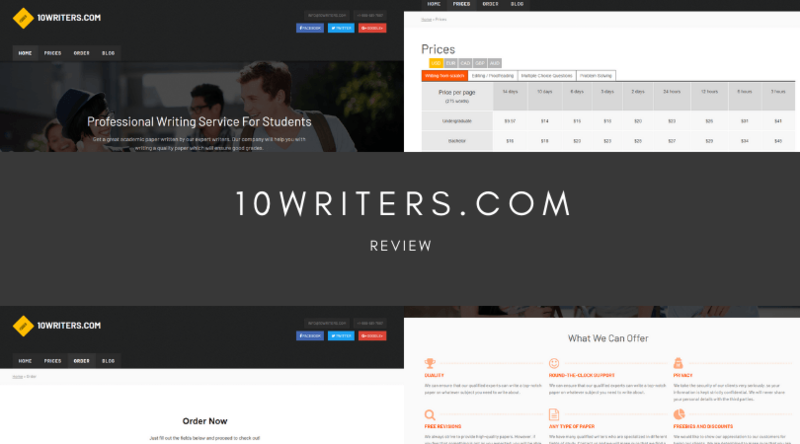 With over 13,000 completed orders, you would imagine that 10Writers.com is the custom essay writing service you’ve been looking for. However, to get things started, there’s not even a dedicated services page where you can see what kind of assignment tasks are available. You’re going to have to make your way through the order form to figure that out. Looking at the types of paper available, there are around 30 services in total which contain a broad selection of assignments ranging from essays to dissertations. While all basic tasks are here, it’s not got everything a 50+ essay writing service has to offer. To figure out the price of your content, you can continue to make your way through the order form to get an accurate quote, or you can use the pricing calculator. You pay the price per page, which then depends on the academic level you want, followed by the deadline you require. To give you an idea of what the quotes are like, a Professional level essay written from scratch with a 3-day deadline will set you back around $28 per page. Compared to other websites, 10Writers is hugely expensive, and probably not suitable for a student living on a tight budget. We were extremely disappointed to see the lack of testimonials and reviews on the website. There is a brief selection on the homepage which is obviously faked due to the picture used, and the dates go back to 2017, meaning they’re nearly two years out of date. This is probably no longer reflective of the service, especially when we search online for more information, only to find more recent customers claiming the content is poorly written, basically researched, and contains many errors a native English speaker wouldn’t make. Of course, one of the most important things you’re going to want to think about is what level of customer service you’re going to get when you need them. Let’s say you wanted to make an edit to your order, or completely order a refund. In the header of the website, you’ll find a single email address, a US phone number, and three social media links, and this is it. There’s no live chat anywhere, no dedicated departmental email addresses, no Skype, the social media pages are unused, and all and all this isn’t promising you’ll get any assistance whatsoever. As you can see, there are lots of things that 10 Writers need to improve on, mainly just updating their service to bring it into the present day. However, until they spend time doing this, it’s clear the service isn’t providing the quality output you would expect or want to pay for. 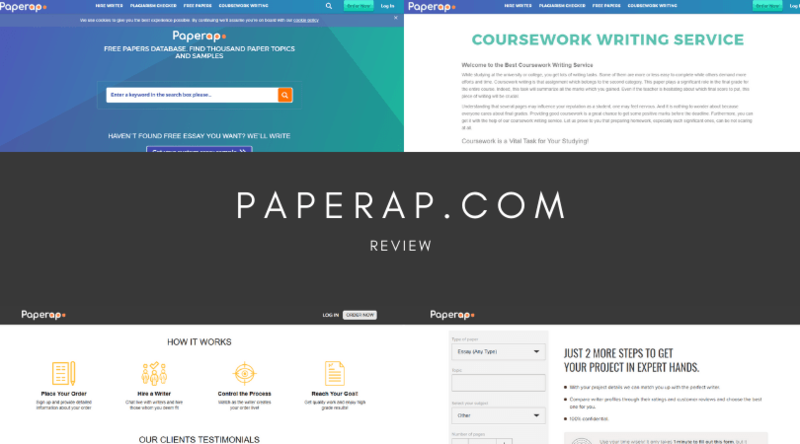 Paper Ap is a custom essay writing service that sets out to help students around the world with their deadlines and coursework, whatever work that may be. The website is split into two parts, a place where you can find papers to download and edit or a service where you can hire a writer to create an assignment for you from scratch. Today, we’re going to be focusing on the latter, but with so many services out there to choose from, it can be hard to know which one is right for you. To assist in this decision, we’re going to venture in and explore the ins and outs of the service, detailing everything you need to know about Paperap. Focusing on the service that writes your essays from scratch (which is the best idea to avoid plagiarism), it’s important to note that this is a secondary service to the paper database, meaning there’s not a lot of dedicated pages set for it. In fact, there’s only an order form for you to go through, but this should have most things you need. Most notably, there are around 30 services to choose from, which may not be as much as the services that offer around 50+ services, but there is still enough basic services that most students should be able to find what they’re looking for. 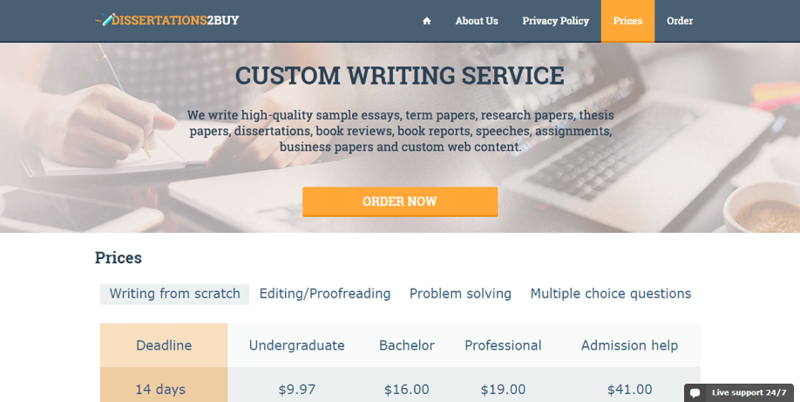 Of course, there’s no denying that pricing is so important when it comes to finding the right custom essay writing service. However, there’s no dedicated pricing page to figure this out; there’s only the order form you’ll need to make your way through. What’s more, even when you’ve filled everything out, you’ll still need to send off and wait for the quote to come back to you! This means there’s no baseline to judge whether the quote is affordable or whether you’re getting ripped off. Be mindful if you proceed. Unfortunately, after extensive searching, there doesn’t seem to be a sign of any reviews or testimonials on the website. This is not ideal since there’s no way you’ll be able to judge the quality of the service from past customers. Either this means there are no past customers, or they’re not showing the reviews, either of which is not very good. Searching online, we found only a handful of reviews, most of which said the content quality was below average and basic at best. It’s also suggested you read through any ordered content yourself to correct any errors or mistakes. The last point you want to be thinking about is how well the company is going to look after you, which means how easily you can get in touch with them. Unfortunately, this seems pretty much impossible because there’s a little info on a contact page. You can get in touch with the service when you’ve made an order, you can speak to your writer, but there’s no guarantee they can manage your order or process a refund or anything like that. While the Paperap.com doesn’t seem like a terrible website, risky but not terrible, almost complete absence of customer service alone makes this an unrecommendable website. If you want to use this website, move forward with caution. As a student, you’ll already be aware of the hardships that come from trying to keep up to date with your academic work. Every lesson and professor is setting you more and more work, and when you have a job, a social life and a million other things to concentrate on, it can all get very stressful. Fortunately, this is why services like IDoAssignment.com exist. 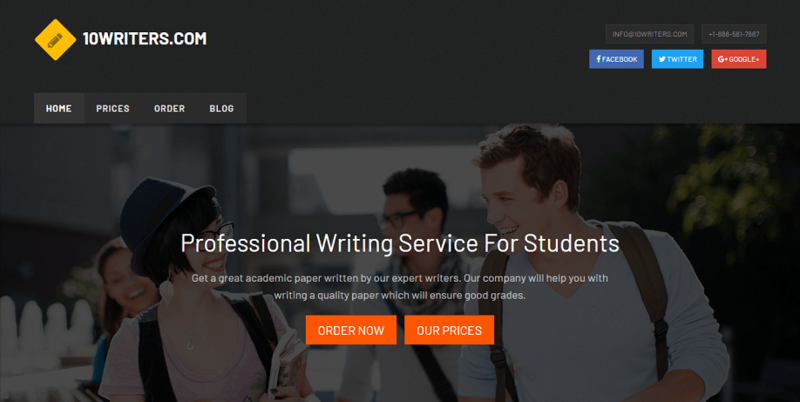 With custom essay services like this, you can order an assignment, or two, or three, to be written by a professional writer to help you meet your deadline and get the grades you’re after. However, with so many of these services existing online, today we’re going to find out whether this is the service you’ve been looking for, or whether you should look elsewhere. While there’s no services page, you’ll be able to find whether the services you’re looking for are available by making your way through the order form. 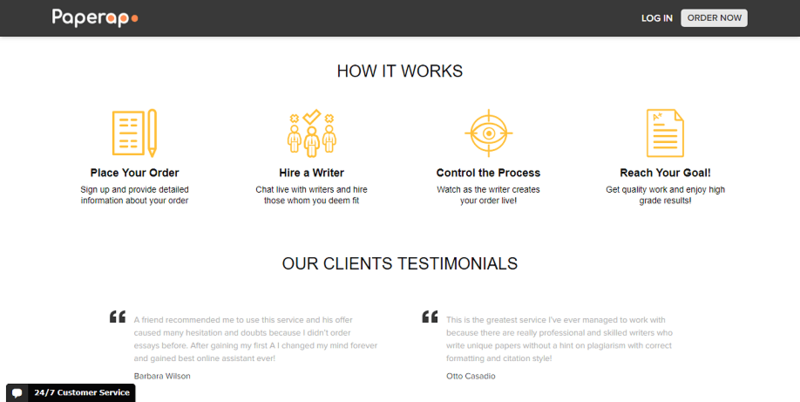 Here, you’ll see that there are five main services that including writing from scratch, all the way through to proofreading and editing services. There are also five academic levels to choose from ranging from high school to a doctorate. There are also around 30 types of assignment type to choose from, and while you should be able to find the basic service you’re looking for, there are a few key ones missing. You can use the pricing page to figure out how much your academic content is going to cost you, and this depends on a number of different features and options. To give you an idea of what the prices are like; a ten-page essay with a 3-day deadline will set you back around $289 at a Master’s level. While this isn’t the most expensive service out there, it definitely isn’t the most affordable, and if you’re looking for an affordable and regular service, you’ll probably want to look elsewhere. There are a few testimonials on the website, which of course boast the website at being a five-star service. However, the problem is that none of these reviews really provide any detail onto what their website experience was, nor do they have dates, meaning the reviews could be years out of date and now no longer relevant. 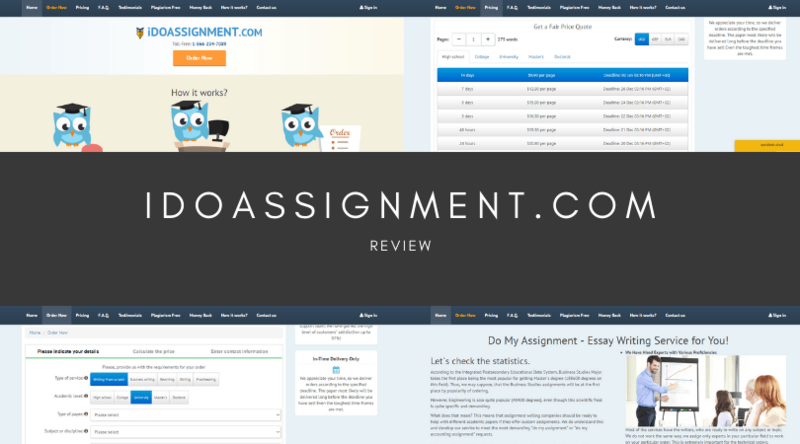 There are few reviews from past customers online, many saying the website content of IDoAssignment was average at best, but you’re probably going to need to read through it to make sure it makes sense, and there are no errors. The level of customer service you get from the company is so important because if you need assistance quickly, you’re going to need it. However, on I Do Assignment, there are only a limited number of ways to get in touch. These include a single email address, a 24-hour live chat, a few social media links and a toll-free phone number for US and Canada. While this seems like a broad selection, it doesn’t seem like many of these channels are active or have fast response times, meaning your urgent assistance may not be very quick. 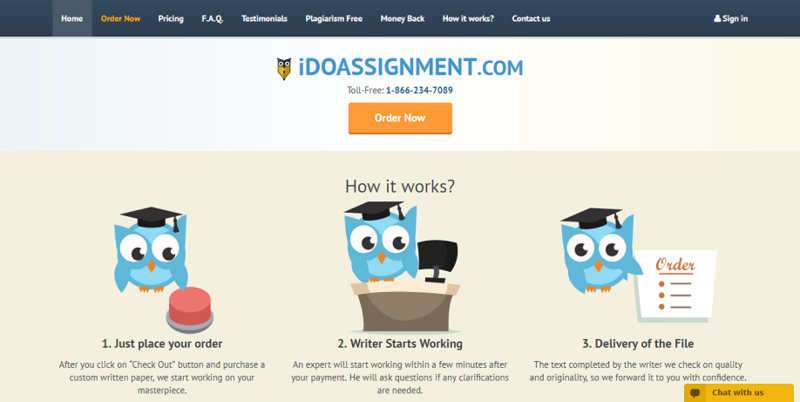 As you can see, although IDoAssignment is not a bad custom essay writing service, there are definitely some areas where it could improve and be more honest its customer. With this in mind, if you’ve got time to edit and don’t mind spending a bit extra, you can use this site. Otherwise, it might pay off to see what other solutions are out there. 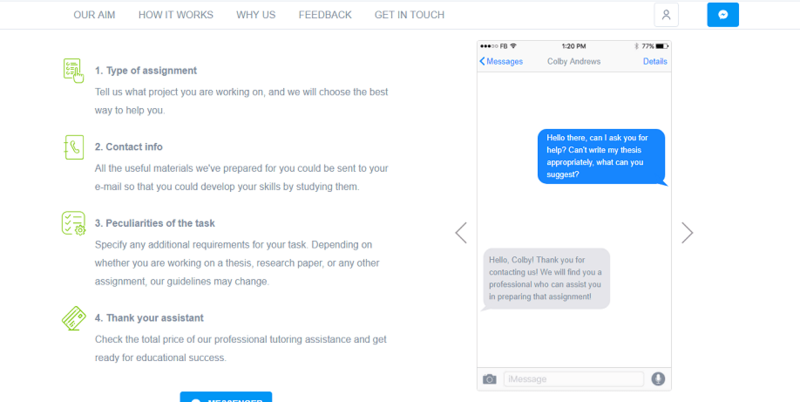 If you’re a student looking a custom essay writing service to help you meet your grade requirements, meet a certain deadline or simply to lessen your workload, you may have come across Essay Bot during your search for a solution. 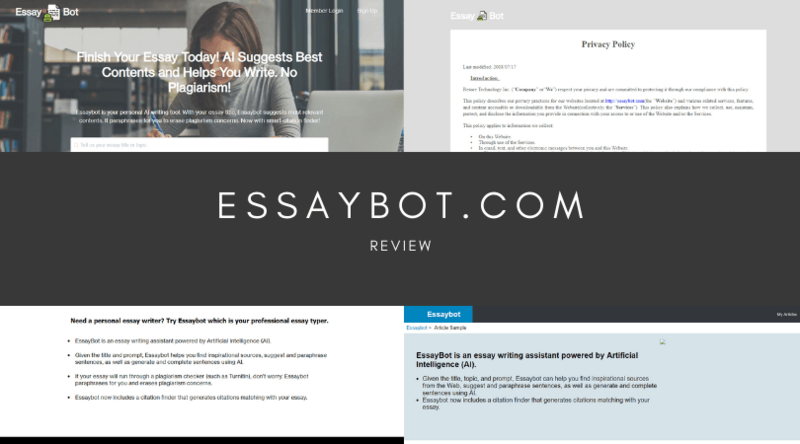 What initially makes EssayBot stand out from other writing services is the fact that it’s uniquely powered by AI; or Artificial Intelligence. 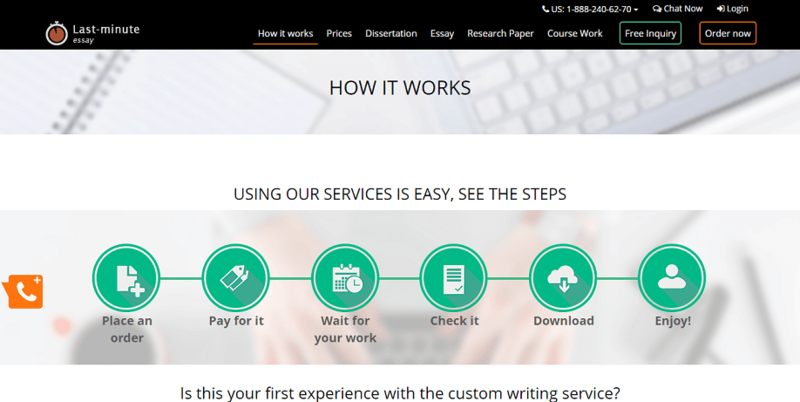 This is an interesting take on custom essay writing services, and sure to pull in the attention of lots of students. However, today we’re going to explore whether this website is worth your money or best off avoided. 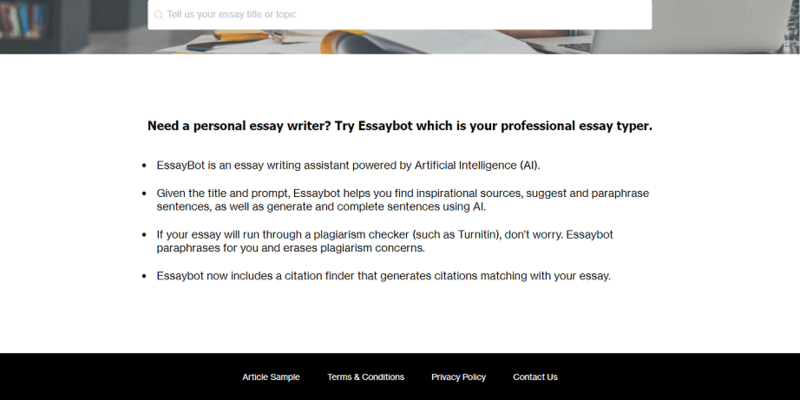 The thing with EssayBot.com is the fact that it doesn’t really have a human writer to write your essay for you but is more of a service that guides you through the writing process. You simply need to put in the required headline of your article and the AI will basically Google search relevant content to help. You can then choose which source you want to use, and the AI will paraphrase and edit the content, so there are no plagiarism issues. This seems sketchy at best, and there’s no telling how effective these anti-plagiarism messages are. Also, the service only seems to support essays. 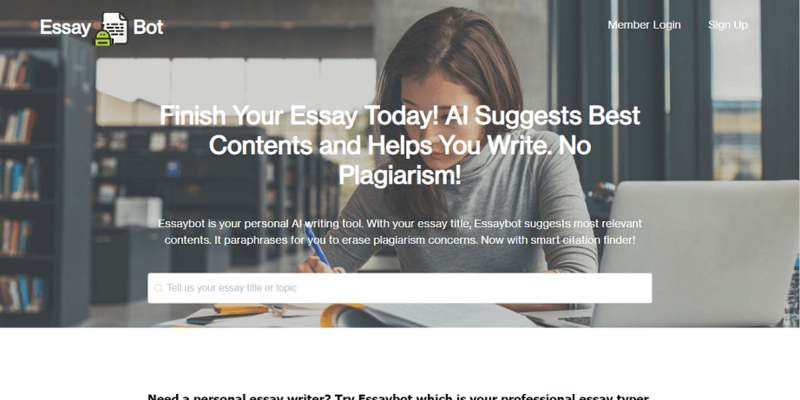 Unlike most custom essay writing services where you simply pay per essay that you’re planning to use or download, Essay Bot is a pay-monthly service where you get unlimited access for a set price. However, this isn’t easily explained on the website, and you’ll need to do some searching, or simply find out when you try to download the essay when you’re finished. After some online searching, we found that you can get a 7-day free trial, which is fine, but then the service is a huge $49 per month for the first month, followed by $99 per month thereafter. This is probably not suitable for many students living on a tight budget. In terms of quality, things are pretty hit and miss. This is because AI simply pulls data from Google and then paraphrases it. It’s then up to the writer to check through it and make sure it’s okay. We plugged a few titles into the AI to see what happened and the content seems pretty good since it’s only replacing certain words. However, there’s no way to tell if the service will help you avoid plagiarism at all costs without scanning it yourself, and it’s simply the words that are changing. If you were to read through the content and the original content, the structure would be identical. Of course, it’s vital you choose a service that’s able to look after you in case you need them, for example, if you urgently require help to download or edit your assignment for an upcoming deadline. However, with EssayBot, this might be easier said than done. On the contact page (which is only accessible by the homepage), you’ll find a map with a physical address for their office, a US toll-free phone number, and a single email address. There’s no live chat, no email address for separate departments, no social media links, and no way of knowing how long the company is going to take to respond; which isn’t great if you require immediate help. All in all, Essay Bot leaves a lot to be desired. The website has a good idea, and it’s easy to see that this form of writing is going to be the future because it doesn’t require human writers. However, this is still early days, and it’s probably worth waiting until the technology improves and can provide a more accurate and diverse service. eWriters.pro is a custom essay writing service that aims to be your one-stop-shop for essays and assignments while you’re in education. The service claims to be able to get your content written from scratch by the deadline you have, getting you the grades you want and all for a price you can afford. However, with so many services out there to choose from, it can be hard to know whether you’re choosing the service that’s right for you. Today, we’re going to explore the ins and outs of eWriters to see whether it’s the service you’ve been looking for. Of course, the first thing you’re going to need to do is to figure out whether you can actually order the service you need through e Writers. However, there are no services pages available which make this easy. The only way you can find out is by making your way through the order form where you can check the drop-down menu. Here, you’ll find around 30 services in total ranging from your standard essays and term papers to speeches and even proofreading services are an option. Again, there is no pricing page available on the website, so you’ll need to make your way through the order form to get an accurate quote for your content, although you won’t need to submit your information to see how much it’s going to cost. To give you an idea on what prices are like, a standard 10-page essay written to a Master’s level with a 5-day deadline will set you back around $354.29. This is easily one of the most expensive services I’ve ever seen, and certainly won’t be suitable for an average student looking for an affordable service. The best way to see what the quality is like is to simply ask the past customers of the service, in this case using the reviews page. However, while there are plenty of glowing reviews, none of them come with a date, meaning they could be years old and no longer representative of the service. What’s more, searching online shows little to no reviews on the service itself. This either means that nobody is reviewing the site, which suggests not many people are using it (therefore making the reviews on the website illegitimate) or the reviews are poor and have been removed. Either way, it doesn’t say a lot of good things for eWriters. Whether you want to place an order but want to ask a question, what to inquire about your order, or you want to request a refund, you’ll need to get in contact with the company. However, there are only a few ways to do this. There’s no contact page, so you’ll need to scroll all the way down to the footer where you’ll find a US phone number, a link to a live chat and two social media profiles. There’s no Skype, no international support, no email address, physical address or email form, potentially leaving a lot of customers in the dark. 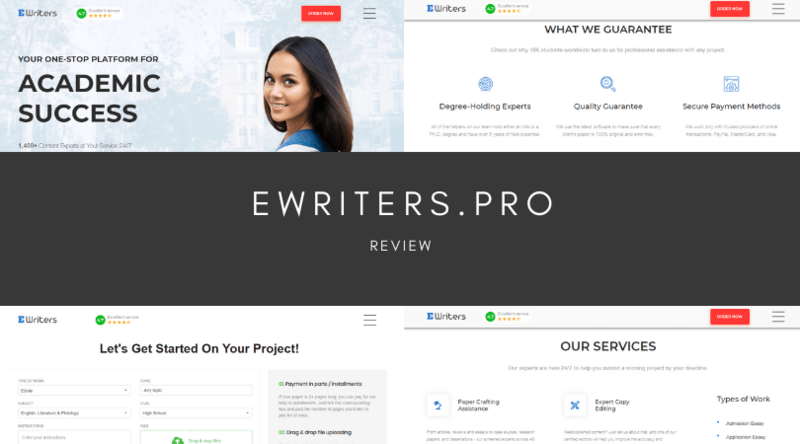 All in all, eWriters.pro leaves a lot of room for improvement, and it’s hit or miss whether you’d want to use it as your custom essay writing service of choice. With limited customer service options, high prices and inconsistent content quality, it’s worth remembering there are other options out there. 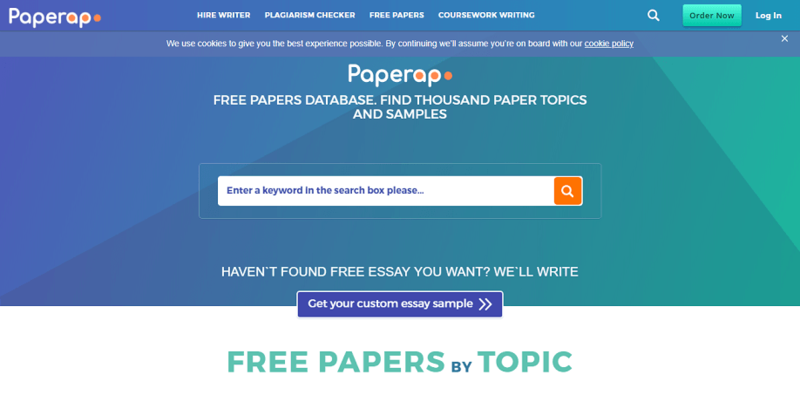 With the claims of being able to improve your academic performance, PapersLab.org is a custom essay writing service that aims to help you complete your writing assignments to get the grades you deserve and want in the fastest possible time. However, before jumping in and placing an order, you’ll want to make sure you’re spending your money in the right place. Today, we’re going to explore the ins and outs of Papers Lab to see whether this is the site you’ve been looking for. Firstly, PapersLab has left me very confused. 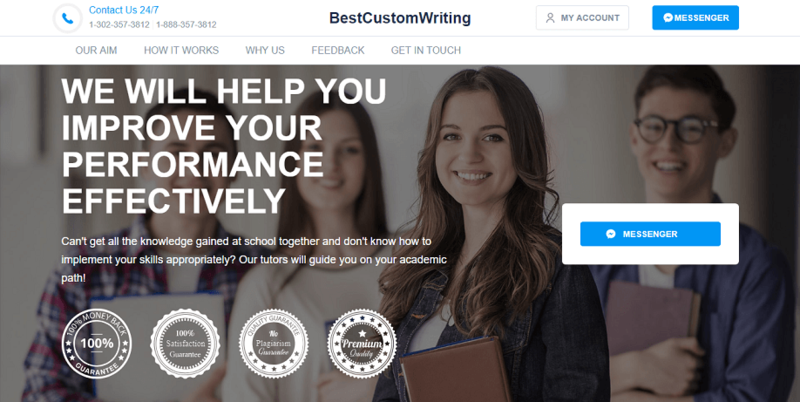 Upon accessing their website, you’ll be taken to a site titled ‘Best Custom Writing’ and doesn’t even seem to write custom essays or assignments, but rather provides you with a tutoring service that aims to share the information you need to get your work completed. In short, if you’re looking for a service that can write your paper for you, this is not it. If you do want a tutor who can help, this could be the site for you. All communications are seemingly made easy from Facebook Messenger, but there’s no indication of what subjects or topics they’re qualified to help with. While the services are fairly confusing and misleading, the pricing system is even worse. There’s no indication of what the pricing system is like or how much you’ll have to pay, or even the ability to secure a quote. The only guess here is that you’ll have to talk to the tutor and ask for the quote yourself through Facebook Messenger, but this is completely illegitimate since they can ask for whatever they want, and you have no way to reference whether this is an acceptable price. Again, there’s no way of knowing what this service is capable of. There are no reviews or testimonials to be found anywhere on the website and searching online is no different. There’s no information on the quality of the PapersLab.org or what kind of content it produces. Even when searching for ‘Best Custom Writing,’ there are no results since this search term is simply far too broad. This leads me to seriously doubt whether this site is legit or just a scam out to get your money. As you can probably guess by now, the customer service experience offered by Papers Lab is practically non-existent. You can contact the company via Messenger or via their Sales email address, but that’s it. 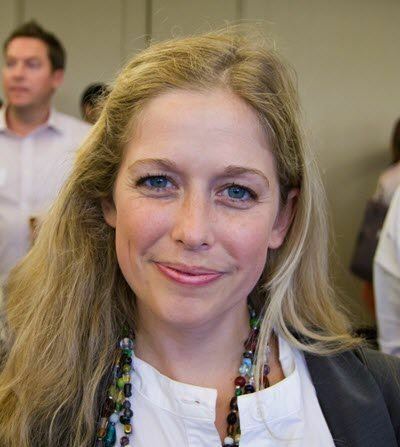 There’re no phone numbers, no international support, no physical office address, social media links or Skype address; furthering my case that this company is a scam. 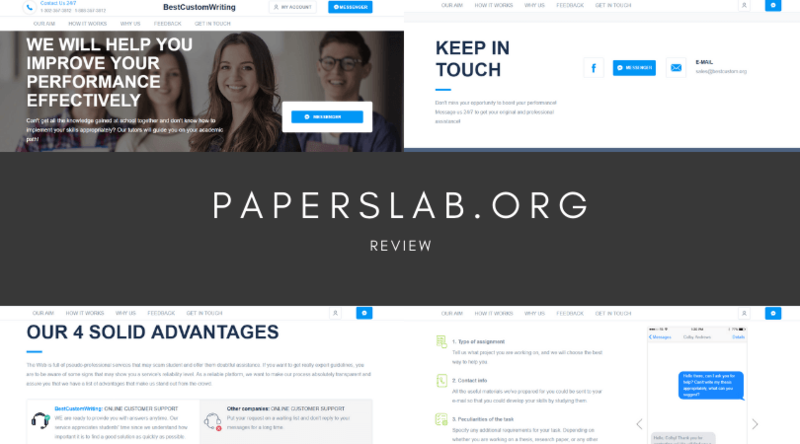 If this is a legit website and offers a professional tutoring service, PapersLab does a very good job at hiding it. With such a poorly executed business model, I would be completely surprised if anyone has used this site in the past, and I can’t seem to grasp what they’re trying to achieve. Be careful if you decide to proceed. Writing a dissertation is no easy feat, and it can take up so much time and effort in your life which, as a student, can be impossible when you have other important engagements. While you need to invest the right amount of time, you also need to make sure you’re getting the grades you deserve. However, thanks to custom essay writing services like Dissertations 2 Buy, you can have a professional writer help you in your endeavors, ensuring you’re able to complete your work on time and to the highest quality, so let’s find out whether this service is all it’s cracked up to be. While there’s no dedicated services page on the website to see whether the service you need is available, you can easily find out based on the order form list at the top of the homepage. In addition to the dissertation writing services, there are also around 30+ other essay writing services you can choose from. At a glance, most students should be able to use the site to get their academic work completed for them on their behalf. However, it’s worth noting there are a few niche services missing, which means you’ll need to go elsewhere. 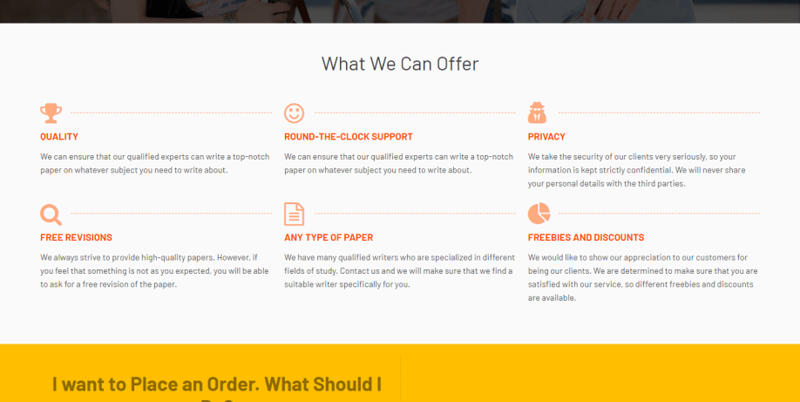 Taking a look at the pricing table on the pricing page, or using the order form for a quote, you’ll see that the service is rather expensive, especially when compared to other writing services of the same caliber. What’s more, there are several things missing, such as multiple academic levels and order deadlines. In short, a standard essay written to a Bachelor’s level that’s ten pages long with a deadline of 3-days will set you back around $230, which will be far too expensive for the majority of students, especially those on a budget. With such high prices, you would automatically expect the content quality to be outstanding, but this, unfortunately, doesn’t seem to be the case. There are absolutely no testimonials to be found anywhere on the website and searching online doesn’t seem much better. The majority of reviews I could find are basic at best; describing the quality as averagely written with several consistent mistakes which are common with non-English speaking writers. The information in the content itself is also fairly average and not anything that couldn’t be found searching online. The customer service you have from a service like this is so important if you want to ask a question, edit your order or request a refund, but Dissertation2Buy.com doesn’t make it easy. There’s no contact page which means you need to hunt around for the contact information. When you do find it, there are phone numbers for the UK, Australia and the US, and two email addresses. There is also a live chat which is 24-hours. However, if you’re using the other methods, there’s no indication as to whether they’ll reply quickly or leave you wondering for days. All in all, it doesn’t seem that Dissertation2Buy is bad service, but it’s definitely not the best. There are plenty of ways the service could improve, making the current condition average at best; so bear this in mind before you order. 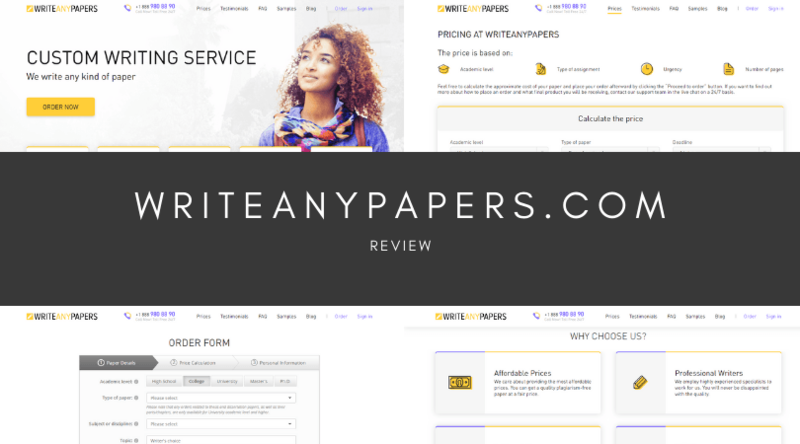 Claiming to be able to write any kind of academic paper you need, the aptly named Write Any Papers is a custom essay writing service that aims to help you get all your assignments done on time and to the highest quality. However, there are plenty of custom essay writing services out there, so what makes this one so special? Today, we’re going to find out by exploring what makes WriteAnyPapers.com, and whether it’s the service, you should be using. Unfortunately, there’s no services page on the website so you can see a complete list of everything assignment type that’s available. However, you can find out by heading over to the order form and start making your way through the process. There are around 30+ different types of service available, and five different academic levels to choose ranging from High School to Ph.D. Also, note that there are no other services available on this site apart from the custom essay writing ones. 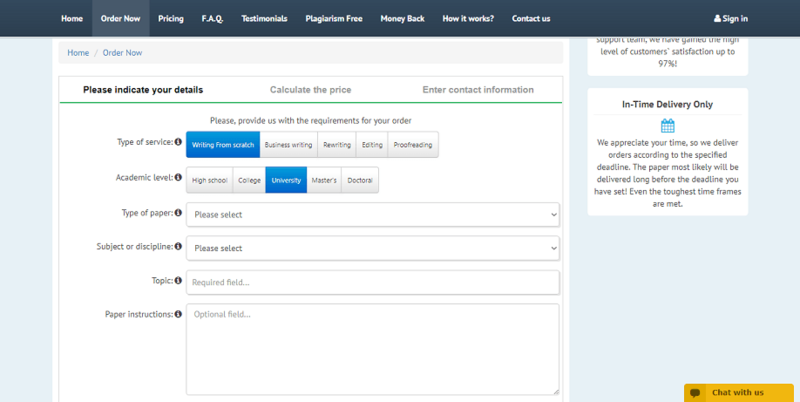 Using the pricing page of the website, or the order form, you can use the table to work out an accurate quote for how much your essay is going to cost. This form is simple to use and will tell you your final price without the optional extras; such as title pages, revisions, and formatting. To give you a rough idea on what the prices are like; a ten-page essay written to a Master’s degree with a 7-day deadline will set you back around $240. While this is not the highest price of this kind of assignment, it still may not be suitable for a student operating within a tight budget. Heading over to the reviews and testimonials page, you’ll find a ton of five-star rated comments saying how amazing the service was for past customers. While this is promising, none of these reviews come with a date, nor much information about the quality of the work itself, which means they are far from legitimate. However, you can judge the quality of the content yourself by using the samples provided. Taking a look through some of these, you’ll soon find the content is fairly average and isn’t outstanding in any way. If this is an example of the best work the site can produce, it’s safe to say there’s better out there; although it’s not bad. Of course, customer service is an important consideration to remember since you may have questions you need to ask, orders you need to edit or refunds you need to request. However, this may all be easier said than done. On the Contacts page, you’ll find a toll-free US phone number, although no international support, a physical office address based in the UK and a single support email. There’s no dedicated pre or post-sales support, no social media links, no Skype and not even a live chat feature available. In short, while WriteAnyPapers is not a terrible custom essay writing service, there are several things that could be improved to make it a whole lot better. If you’re a student looking for urgent and accurate assistance that will provide you with good grades, bear all this in mind and I would suggest using another writing service. 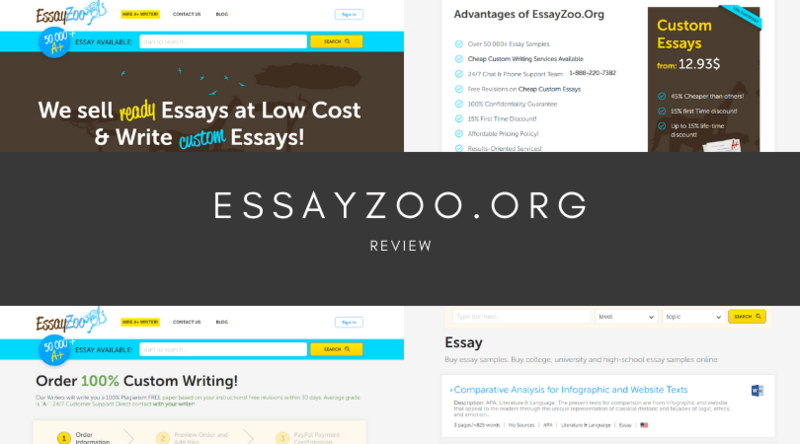 EssayZoo.org Review – Plagiarism Issues? 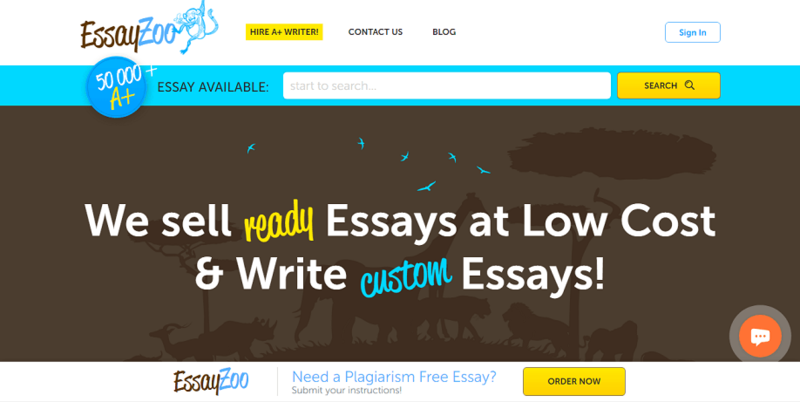 Essay Zoo is one of those custom essay writing services that looks like everything you’ve been looking for; a lighthouse while you’re travelling the waves of the internet looking for a professional content service. 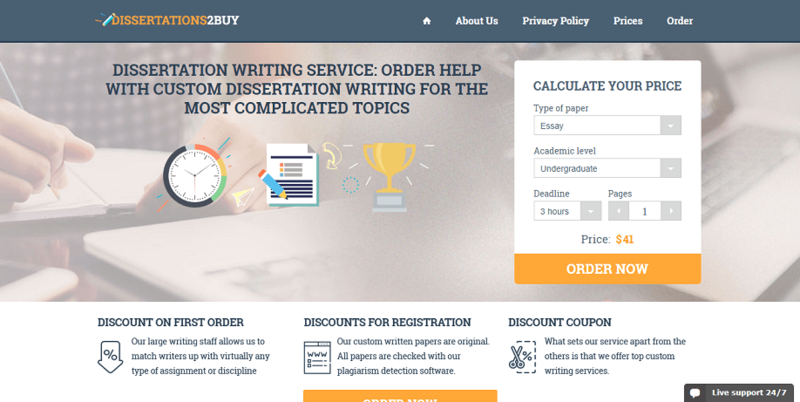 Claiming to have completed over 50,000 A+ assignments, it’s no wonder you fell drawn to having EssayZoo as your custom essay writing service of choice. However, before you start spending your hard-earned money, let’s check the website out to see whether it’s as good as it claims to be. 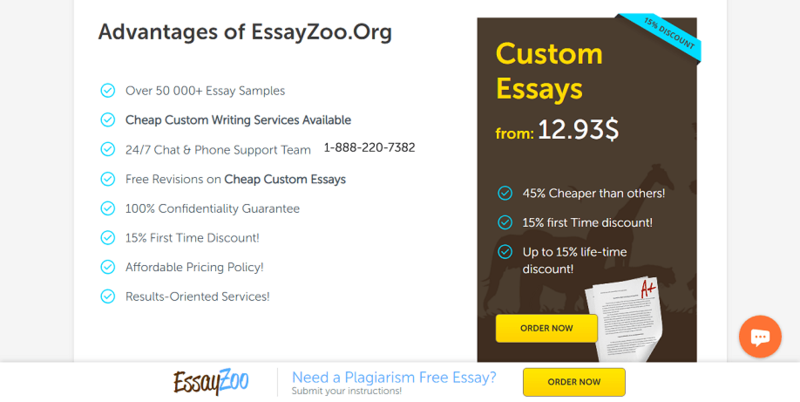 While this fits into the niche of a custom essay writing service, it turns out that EssayZoo.org is more of an essay database filled with ready-made essays you can buy and use in your own assignments and hand in on your own deadlines. 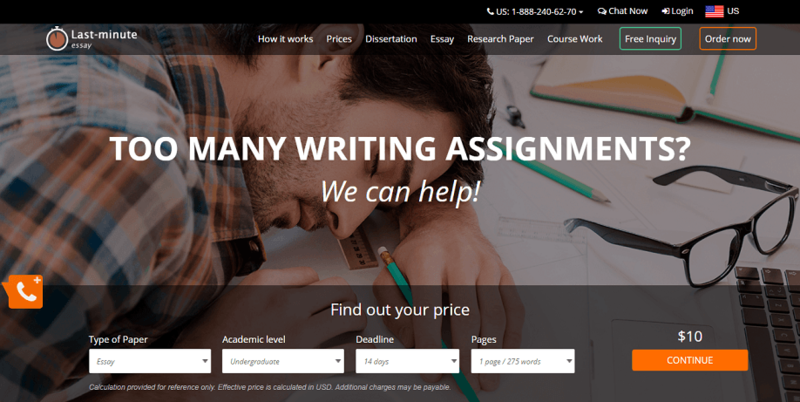 However, while there are seemingly over 50,000 essays ready for you to download, there doesn’t seem to be any services where you can order the assignment you need. You’ll need to find one that’s already written. Otherwise, you won’t be able to use the website. 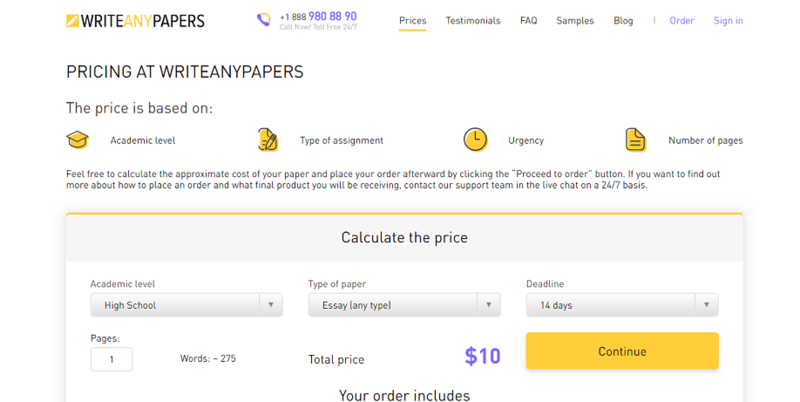 Since you’re purchasing ready-made essays, this custom essay writing service website sets a pre-paid price for whatever assignment you choose. This means there’s no set price for the content, but it will solely depend on the piece itself. There’s no indication as to how these prices are set, what basis the prices are set on, so there’s no way of knowing if you’re getting a good deal. The prices vary dramatically, with some being affordable, some not, so it depends on the individual piece you want to buy. There’s no indication as to who the writers are for each piece, but you can tell that there are different writers since each piece varies in quality and the style that it’s written in. Looking through a few pieces, you can see that some are written well, and some are not. What’s more, the quality of the content itself will vary from piece to piece, including grammar, punctuation and sentence structure. Some are poor; some are acceptable, so make sure you’re checking them beforehand. As with any business, you need to make sure the customer service options available to you are comprehensive, so you can get in touch if you need them to ask a question, make an edit to your order, or request a refund. Fortunately, there are plenty of options available. There’s email, a physical address, phone numbers, and constant live chat. In fact, the website specifically states that you won’t have to be waiting longer than 30 minutes to get a response, no matter what time of the day you message them. All in all, Essay Zoo doesn’t look like a bad site. In terms of customer service, the site is average, but the dynamic of the website is flawed. After all, if more than two people buy an essay and use it, is this going to cause plagiarism issues that can get you kicked off your course? With that single fact in mind, it may be worth looking at other sites. Have you found yourself overwhelmed with the number of writing assignments and coursework you’ve been set, and you don’t think you’ll have enough time to get everything done, or at least to the quality that you need to get the grades you deserve? Don’t worry; you’re not alone. In fact, there are plenty of custom essay writing services just like Last Minute Essay which are designed to help. However, you’ll want to make sure you’re choosing the best service for you. To help you make this decision, we’re going to explore the ins and outs of the service. Judging by the list of services displayed in the order form of the Last-Minute-Essay homepage, you’ll see a broad selection of academic assignment types for you to choose from. These range from standard types like essays and term papers to more complicated services like dissertations and thesis. There’s also a range of academic services to choose from (although not all of them) and a variety of deadline options. However, this does seem like a rather basic service since no extra services are offered. It’s unfortunate to see that there’s no pricing page on the website so you can refer to how much your assignment is going to cost. However, you can work it out based on the order form information from the homepage. However, these services seem rather higher than the average service cost, with one page of a Bachelor’s essay with a 3-day deadline costing a huge £18.17. This isn’t suitable for students on a budget. For the price Last-Minute-Essay.com is charging, you would expect the quality to be absolutely spot on with no flaws whatsoever. However, this doesn’t seem to be the case. Unfortunately, the content is hard to judge since there are no samples of the content on the website, nor are there any comprehensive reviews of testimonials. Nevertheless, searching online I discovered a range of mixed reviews, some claiming the service was ‘OK,’ whereas others described a lack of sentence structure, poorly researched content and a distinct lack of proper English grammar. As with any custom writing service, you’re going to need to get in touch with Last-Minute-Essay if you have a question, a request, a refund problem, or you just want to make an edit to your order. However, there are only a few ways to go about this. The available methods include a US, UK, and Canadian phone number, with a notable lack of support for any students outside these areas. There’s also a live chat service available, although this only operates during set hours of the day, and then that’s it. There are no social media links, no international support, few email addresses, no dedicated content page, no Skype content and more. This makes getting in touch and getting a quick response to your query quite difficult and may leave you with more problems than you started with. 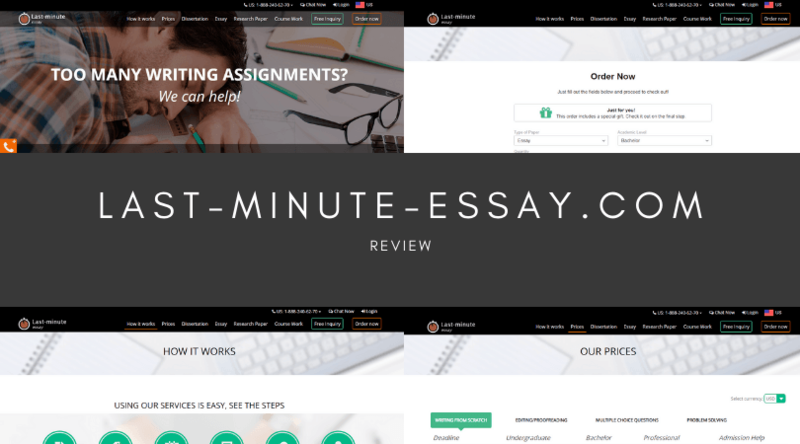 All in all, while Last Minute Essay isn’t the worst website in the world, there’s plenty of room for improvement which many students will be looking for. 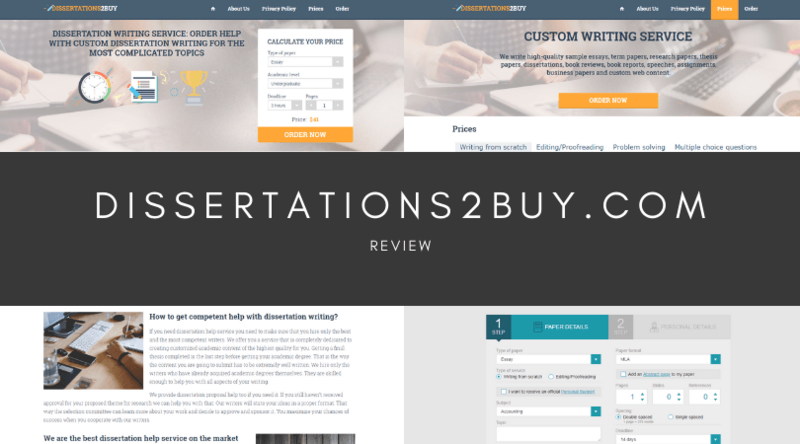 Unless you’re desperate for content, we highly recommend reconsidering the custom essay service you choose.